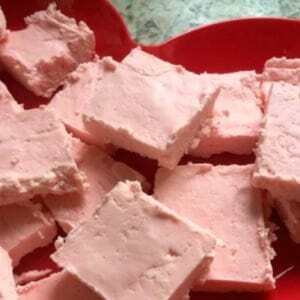 This strawberry fudge is almost too good to be true. It only takes a couple of minutes to make, and it is made from only two ingredients! Really, that’s it! Place the white chocolate chips in a microwaveable bowl. Heat for 1 minute, stir, and then heat for 30 more seconds. Stir, and heat for 30 more seconds and the chips should be melted. After the white chocolate chips are melted, stir in the can of strawberry frosting, continuing to stir until the two are completely mixed. Spread fudge into a greased 9×9-inch baking dish and then place in the refrigerator for an hour or so until it hardens. Cut the fudge into small squares. Happy Valentine’s Day!